Fighting and cooking… while on the surface they seem worlds apart, if you study them closely, they are much the same. They both require dedication, concentration, creativity, and, of course, expert blade skills. For this reason, legendary shinobi and keen chef Master Hanzo believes that a truly gifted student might just be capable of knocking up a fabled Super Dish. The aforementioned Super Dish is something so bountiful and delicious, words cannot describe its tastiness. Being the cunning fox he is, Master Hanzo has devised a plan to convince the shinobi warriors of the Senran Kagura franchise to cook for him. He will hold a grand competition, with a prize so wonderful and magical, nobody in their right mind could resist. The first annual Super Dish Gourmet Cook-off will offer the winner a Secret Ninja Art Scroll; a magical item that grants one wish to whomever possesses it. Such a prize will surely entice all of the girls to compete, and a gathering of so many Shinobi in one place is bound to bring drama, chaos, and a smorgasbord of titillating antics! 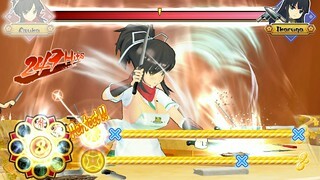 Unlike previous entries in the Senran Kagura series, Bon Appetit! veers away from its beat ’em up roots and into new territory. Players’ reflexes, memory, and reaction speeds are all put to the test, with fast-paced rhythm/action gameplay combined with delightful and infectious Japanese music. There are 10 songs to perfect and 10 super dishes to create from day one, with plenty more to come via the Gessen x Hebijo DLC pack. Each shinobi has their own unique story spread over five cooking battles, so there’s plenty more to learn about each and every character. In addition to this, all character and costume DLC from the other PS Vita exclusive title Senran Kagura Shinovi Versus is compatible with Bon Appétit!, and all players that download the Senran Kagura Bon Appétit! Gessen x Hebijo DLC pack will be treated to a free soundtrack app featuring songs from the game. While Bon Appétit! may not be for everyone, it’s often the acquired taste that gives the most satisfaction. Download it digitally for PS Vita via the PlayStation Store on November 11th. Awesome! Wasn’t expecting a release so soon after Shinovi, need to scrape together some money! Thanks! I wonder if we will also get the DLC that comes with some exclusive avatars. Out of nowhere! Yes! I was hoping this would come here. Day one.. no, HOUR one purchase. Can’t wait. Oh, hey, any word if it’s Playstation TV compatible, too? Can’t say I don’t love the idea or artwork. But digital only, and at 2/3 the cost of a retail PS4 game? Sounds like a money grab at the inavailability of Vita titles, not too mention sexual influences. Maybe I just find that button sequence mashing isn’t much for gameplay after trying Diva Project. Of course, no way I would have, if, it hadn’t gone on sale for almost a 1/4 of its listed price recently. I for one, will not be buying or supporting these games, untill there is a serious reduction in price or a retail copy. What will the price be for the game and the DLC pack? Also will the DLC pack be available on release day? The game will be $14.99, and the Gessen x Hebijo DLC pack will be available two weeks later on November 25 for $14.99 also. Glad it came to Vta either way. Now you just to get reasonable with the price already. Will this game work on Playstation TV? Dang. I’m a sucker for rhythm games…I may have to check this one out. Price? Price for the main pack is $14.99! You can purchase the Gessen x Hebijo DLC pack for $14.99 as well, but it’s optional. I’m gonna be buying this IMMEDIATELY. Hopefully the Gessen x Hebijo dlc comes out very soon after!! Thanks!! The Gessen x Hebijo DLC will follow two weeks after on November 25! @#10 wtf are you talking about? Probably meant the Samurai Warriors 4 post. #9 Not sure yet BlueBlizzard, but I can guess. Actually, the main pack is $14.99! I’m assuming you mean Shinovi Vs? If you think so more power to you. I’m loving it, but even so, you’re renting games from gamefly and not actually buying so your opinion isn’t relevant lol. Most of you rent or trade in. So his opinion is relevant, just wrong post. Rarely do I see purchases made on activity. And blocking it, is even more shadey. Some of you are even worse by giving bad info, on a game you want to resell. Such is the way of too much of the world. Sounds small, so I imagine it’d going to priced a little cheaper than usual unless I’m misunderstanding. I’ll have to keep an eye on it before deciding if I’d purchase but nevertheless I’m glad Senran did well enough here to warrant more releases. Sony is not even there for the PS Vita, looks at the games coming out … I will finish my persona 4 and then I will try to trade for a 3DS. I saw gameplay and heard some of the music and yea imma pass on this one. When it comes to rythem games it comes down to if I wanna hear the same song over and over and for this game that’s not the case. I will be waiting for the PS4 game. Loving Shinovi Versus so definitely picking this up, didn’t think it was coming so soon though. Great news! Thanks for the support! I hope you enjoy it! Thanks for the reply Steve, oh I mean Kelly. Notice I used the word guess, and with the post being today, wouldn’t it have been a good idea to include. Funny how replies are selective, hmm? Glad to see this will be more reasonable, but getting the full game is still roughly 29.99. So Actually, I was not wrong. Is this digital only or retail too? It’s digital only. We’re releasing the game in the exact same way as the Japanese version was originally released, which is digital only with a “main pack” and a “DLC pack”. 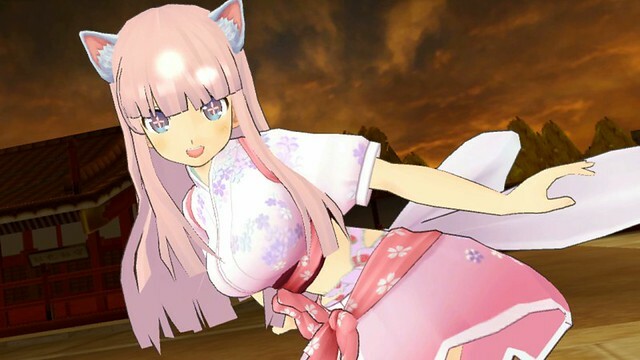 I know it is still in the early stages of development but please consider bringing Estival Versus on the PS4 state side as well. Oh yeah it’s worth mentioning the DLC from Shinovi works on Bon Apeetit to but not the other way around for anyone who doesn’t know. IDK if that only applies to costumes or what. I’ve been really interested in both this and Shinovi Versus so I’ll definitely be picking both up. Dante’s Inferno Ultimate Edition and all three Fatal Frames. Aw yiss. Would care if it were retail, I’d pay more. Japan ended up with one. Waiting for a sale. Since the DLC is the same price as the game making it $30. Wow, Fairly prices as well for digital just like Hatsune Miku Vita Day 1 last year. Thank you Marvelous/XSeed, will always buy your games. Wow, so much Senran Kagura all at once! We got SK: Shinovi V.S. last week (Let’s Get Physical Edition, F.t.w), and now “Bon Appetit” has a release date. Thanks for the Blog post, Steven Tarry. Wow I wasn’t expecting an announcement so soon. November is going to be a good month! Any idea how big the game will be? Nice, will it be PSTV Compatible or Vita only? You guys are f*****ng awesome! I really wish I had a Vita. We constantly ask for more AAA games and get crap like this….. Why did I buy a Vita again? “Most of you rent or trade in. Firstly, try having me on PSN and you’ll see who rents games. I BUY my physical games, do I trade in? If the game isn’t good yes, but that’s because it’s not good. Did I buy the game and support the game yes, does me trading it in give them take money away, probably, probably not. Why? Because if you really wanted a game and wanted to support it I doubt you’d have waited a year for my trade in than buy my $5 marked down price game over supporting the devs anyways. It isn’t relevant because they were completely cheaping out on a gamefly rental, which is worse than trading it in honestly. I keep every good game, I have the Sonic Transformed on PS+ for Vita, but still own my physical copy too, that’s just the kind of thing a supporter does. I own Gravity Rush Digital and Physical, same for PlayStation All-Stars for Vita too lol, and the PS3 version. I can proudly say renting is irrelevant. Every Vita game I’ve bought Physical this year is still in my possession lol. Because you might be guilty doesn’t mean you should through a silly defence. I really appreciate the effort guys, but I think I’ll skip out on this one. Quick Q boyz, Senran Kagura is known for its you know fan service ….. so is this western ver. of it will be tuned down ? Do you even realize I am on your friends list? I can see what digtal titles you buy through Vita, and if not, with open activity it can be seen. I was not trying to make it into a money issue, as to who shows the most support. The fact you seem to not notice how many titles I buy digitally shows your lack of knowing what your talking about, as well as not caring about your friends. Yes I buy them on sale, but I buy them very,very often. And regularly. I don’t trade in, and I don’t use Plus to get free games usually. You got a couple of worthless trade-ins that you have on Plus, and you compare that to buying them constantly? Like buying games like Flower, Flow, and almost every other PSN Sony game like I do, even when I buy for the thought of it being created? So Ryu didnt like a game and said so. Because he rents them, it makes his point mute in your eyes. I put the kids to bed already, and now it is your turn. Good Night, and pleasant dreams. Cute, but not enough content for a purchase.This should have been or probably was a side game on VS.I have the game, love it but Im not buying this.Ill wait for a year and get it for its true price. Thanks for bringing over SK:SV Xseed. Im having fun playing it! Darn, I love rhythm games but this one is too pervy for me. Will i be able to play Bon Appetit! on Vita TV/Playstation TV? OMG I’m so happy this is being localized :3, is it going to be playstation tv compatible? I know the JP version is vita tv compatible, but some games like Ys and neptunia rebirth work on vita tv but not ps tv, anyone know? Thank chu for being so awesome localization people! TY Xseed. I loved Senran SV got the Platinum Trophy the other day! Will pick up Bon Apatite when it’s available. Hopefully you guys make enough so you can bring Senran FV over in the future.